Symco Group has a customer who has four Opex 51 Mail Extractor Systems for sale. Please contact Symco Group today if you are interested in more information or pricing. 800-878-8002 or info@symcogroup.com. 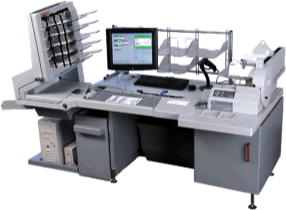 OPEX Model 51 Rapid Extraction Desk offers speed, efficiency and automatic adjustments to handle a variety of intermixed mail. The advanced design of the Model 51 provides high-precision control for semi-automatic mail extraction, including fine adjustment settings for accurate cutting. Advanced ergonomic features include workstation hydraulics to adjust the work surface height, convenient desktop, customized sort configurations and easy accessibility. Depending upon your specific mail automation needs, the Model 51 allows you to choose three different cycling modes. The exclusive Thickness Profiling Candler of the machine performs a second check of the envelope for content security. OPEX offers a variety of optional enhancements for the Model 51, including an onboard Performance Control Center, Sort Trays, Mail Tray Holder, and Hydraulic Height Adjustment.